A NEW Lodge mother says her 12-year-old daughter is ‘terrified’ to get on another bus after she was assaulted on her way to school. 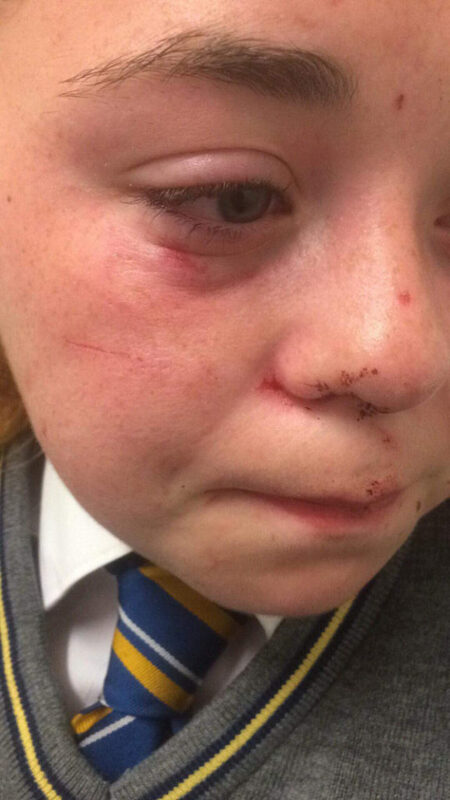 Trinity College pupil Ria Saunders was left with cuts and bruises to her face and head after the incident on a Translink 1D Metro service last Wednesday morning. Speaking from her home, Ria recalled what happened on her way to school. “I remember walking down the stairs of the bus and a girl, who was about 15 started soaking a group of us with Boost. I turned around and asked what she was doing and soaked her back with my drink. Mum Roisin said she broke down in tears when she saw the state of her daughter following the assault. “Ria was going to school as normal using the 1D bus – she gets on at the Waterworks,” she explained. “I got a phone call from the school to come and get her. Her face was covered in blood and scratches and she had lumps on her head. I had to take her to hospital. “Police have CCTV footage of it and have advised me not to watch it because it is so horrific. “It wasn’t until the bus driver heard her screams that stopped the bus to get her off. “I broke down in tears when I saw the state of her. I couldn’t believe something like this could happen in this day of age. “To me, it is obvious it was a sectarian motive. It is something that would have happened when I was growing up. Roisin praised Trinity College staff who have rallied around Ria in the wake of the incident. “The school have been absolutely brilliant and have been constantly on the phone concerned about her and even sent cards and flowers to Ria. “She had an exam last Friday and a teacher picked her up and brought her home. Sergeant David Adams said: “We believe this incident took place earlier that day between 8.20 – 8.30am as a 12-year-old girl was getting off at a stop. It was reported that a number of other young people were involved.